The island that lends its name to the entire 1,500-mile-long Hawaiian archipelago — is where Mother Nature pulled out all the stops. Simply put, it’s spectacular. The Big Island has it all: fiery volcanoes and sparkling waterfalls, black-lava deserts and snowcapped mountain peaks, tropical rain forests and alpine meadows, a glacial lake and miles of golden, black, and even green-sand beaches. The Big Island has an unmatched diversity of terrain and climate. A 50-mile drive will take you from snowy winter to sultry summer, passing through spring or fall along the way. The island looks like the inside of a barbecue pit on one side, and a lush jungle on the other. The Big Island is the largest island in the Hawaiian chain (4,038 sq. miles — about the size of Connecticut), the youngest (800,000 years), and the least populated (with 30 people per sq. mile). It has the highest peaks in the Pacific, the most volcanoes of any Hawaiian island, and the newest land on earth. Steeped in tradition and shrouded in the primal mist of creation, the Big Island radiates what the Hawaiians call mana, a sense of spirituality that’s still apparent through the acres of petroglyphs etched in the black lava, the numerous heiau (temples), burial caves scattered in the cliffs, sacred shrines both on land and in the sea, and even the sound the wind makes as it blows across the desolate lava fields. The Big Island is not for everyone, however. It refuses to fit the stereotype of a tropical island. Some tourists are taken aback at the sight of stark fields of lava or black-sand beaches. You must remember that it’s big (expect to do lots of driving). And you may have to go out of your way if you’re looking for traditional tropical beauty, such as a quintessential white-sand beach. On the other hand, if you’re into water sports, this is paradise. The two tall volcanoes mean the water on the leeward side is calm 350 days a year. The underwater landscape of caves, cliffs, and tunnels attracts a stunning array of colorful marine life. The island’s west coast is one of the best destinations in the world for big-game fishing. And its miles of remote coastline are a kayaker’s dream of caves, secluded coves, and crescent-shaped beaches reachable only by sea. On land, hikers, bikers, and horseback riders can head up and down a volcano, across beaches, into remote valleys, and through rain forests without seeing another soul. Bird-watchers are rewarded with sightings of the rare, rapidly dwindling native birds of Hawaii. Golfers can find nirvana on a wide variety of courses. This is the least-explored island in the Hawaiian chain, but if you’re looking to get away from it all and back to nature in its most primal state, that might be the best thing about it. Where else can you witness fiery creation and swim with dolphins; ponder the stars from the world’s tallest mountain and catch a blue marlin; downhill-ski and surf the waves in a single day? You can do all this and more on only one island in the world: the Big Island of Hawaii. Hawaii’s Big Island is an incredible collection of many diverse micro-environments, each with its own weather. You can travel through all but two of the world’s different climate zones on Hawaii ranging from Wet Tropical to Polar Tundra, a result of the shielding effect and elevations of the massive volcanoes Maunakea and Maunaloa. Experience this for yourself as you explore Hawaii Island by car or helicopter. See the tropical rain forests in the Hamakua Coast, the cool uplands of Waimea, the volcanic deserts of Kau and the sunny beaches of Kona, all within the span of a day’s drive. Travel to Kona International Airport (KOA) in Kona to the west, or Hilo International Airport (ITO) in Hilo to the east. Most visitors arrive in Kona. There is also the option of flying into Honolulu International Airport (HNL) on Oahu first and then taking a short, 35-40 minute flight to Hawaii’s Big Island. Getting to Hawaii’s Big Island is easier than ever with daily direct flights into Kona International Airport. Major air carriers from Canada, the U.S. and Japan fly directly into Kona. Most of the direct flights are from the U.S. West Coast — mostly Los Angeles and San Francisco — plus Denver, Phoenix, Salt Lake City and Chicago, and internationally from Tokyo. Some seasonal carriers also make the trip with charters. Because the island is so big, consider arriving on one side of the island and departing from the other. For example, you might fly into Kona, exploring that side of the island awhile, then driving to the Hilo side (roughly 2 hrs, 30 min) and exploring for awhile longer before flying out from the Hilo Airport, or vice-versa. (Be sure to ask car rental companies about drop off charges). Major resort destinations on Hawaii’s Big Island include the Kohala Coast, Historic Kailua Village (Kailua-Kona) and Keauhou, both in Kona. 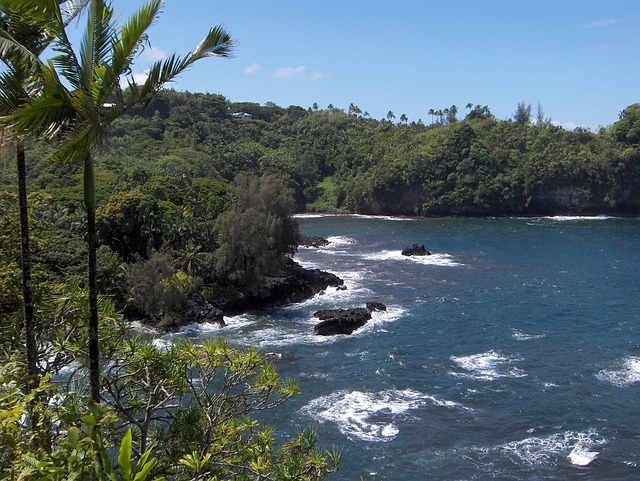 There are hotels and accommodations in Hilo and Puna on the east side closer to Hawaii Volcanoes National Park. Throughout the island you’ll also find bed and breakfast accommodations, condominiums, vacation rental homes and cottages, as well as hostels. We recommend a rental car for flexibility and ease, and we strongly suggest booking before you arrive — sometimes cars aren’t immediately available when you step up to the counter without a reservation. All the major rental companies are found on the Big Island. There are also guided tours of every type from bus tours and taxis to private limos. Rental car agencies are located at the Kona and Hilo International Airports, as well as some resorts. Rental car companies are located just a short distance from both inter-island terminals. Taxis are available curbside. The Big Island of Hawaii may not have the giant malls and shopping centers that you’d find on Oahu or even Maui, but there are still plenty of shopping adventures to be found on the island. From trend-setting resort shops along the Kohala Coast to the Walmart in Hilo (a favorite night-time hangout spot for locals), the Big Island has enough venues to satisfy any shopaholic.